This is a Kapampangan version of the suam na mais. Instead of using corn as the thickening agent, this suam dish uses misua. And instead of shrimp and corn, this version utilize mud crabs or alimango. Mud crabs are expensive so you might wonder why such a high valued shellfish will just be used in a simple dish such as suam na alimango. 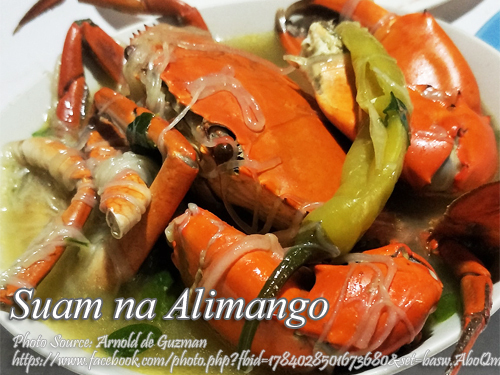 The reason is, mud crabs are abundant in Pampanga so they can afford to make such simple dishes using mud crabs. Clean the crabs and cut crosswise in two pieces of each mud crab. Heat oil in a pot and saute garlic, onion and ginger. Saute until the onions are soft. Add in the mud crabs and saute for one minute. Then pour the rice washing on the pot. Add more liquid if necessary just enough to cover the mud crabs. Bring to a boil and add in siling haba and misua. When the misua and mud crabs is already cooked, add in the malunggay leaves and season with salt. Turn off heat and serve hot.